Hello everyone! 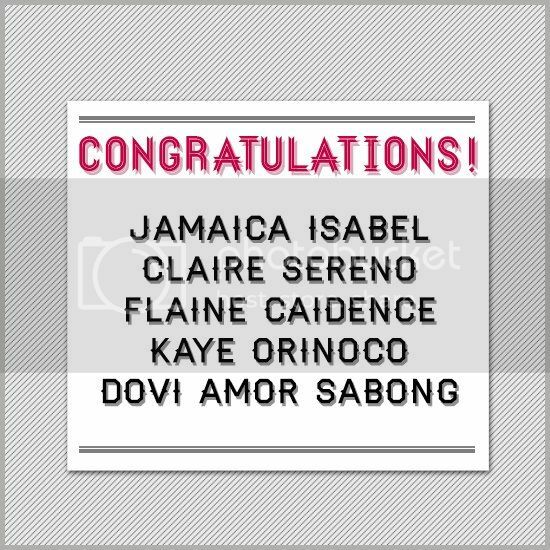 Here are the winners to The Capricorn Babies Giveaway! To the winners please email me (yanadelacruz@gmail.com) or any one of us your details so we could send your prizes asap. BTW, I’d like to thank everyone who joined and supported our giveaway! There are more giveaways to come (I promise!) So stay tuned! Oh, I’ll be posting new entries! Don’t forget to visit me tomorrow, ok?